I’ve become friends with a couple of long time customers who are writers. Charles de Lint and Rob McLennan are two writers worthy of your attention. It was through Rob that I found about another long time customer who had his first book published last year. I finally got a copy of “Into The Current” by Jared Young last week and had time during my recent illness to read it. I tore through the 378 pages in a day. I have never read a book that fast before. The story of Daniel Solomon kept me going chapter after chapter until the end. It’s about a young man trapped in time reviewing his life for the benefit of a loved one. I highly recommend it. Now I can start reading Charles’s new book “A Wind In His Heart”. Generations: Ms. Marvel & Ms. Marvel #1 – G. Willow Wilson (writer) Paolo Villanelli (art) Ian Herring (colours) VC’s Joe Caramagna (letters). I half expected this to be similar in silliness to the Captain Marvel and Captain Mar-Vell Generations book from last week what with Kamala being a teenager and all, but this wasn’t a juvenile romp through time. G. Willow Wilson plunked Kamala down during the time that women were fighting for equal rights, not to say that they still aren’t, and had the two heroes working together to fend off the attack of an evil alien. The new Ms. Marvel has an epiphany about her super hero status and I think that’s what these Generations books are meant to show us fans. This one worked better than others. Batman: The Red Death #1 – Joshua Williamson (writer) Carmine Di Giandomenico (art) Ivan Plascencia (colours) Tom Napolitano (letters). 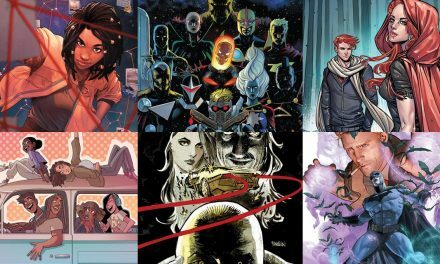 As if DC’s 52 universes aren’t enough, now we have 52 Dark Universes to contend with. This is where this amalgam of Batman and the Flash comes from to threaten Central City and Barry Allen’s loved ones. This big Batman event reminds me of the big Green Lantern Blackest Night event but the mix of Batman and the other members of the Justice League as the bad guys looks interesting. There’s a cool hidden message on page 7 that took me a while to figure out but I was tickled when I did. Wonder Woman/Conan #1 – Gail Simone (writer) Aaron Lopresti (pencils) Matt Ryan (inks) Wendy Broome (colours) Saida Temofonte (letters). Two of my favourite characters are joined together in this 6-issue mini where a woman warrior who looks a lot like Diana is held captive by a slaver who uses her to fight in an arena and it’s Conan to the rescue. It’s nice to see Aaron Lopresti’s art on the racks again and I like his version of the Crow Girls. I’m curious to see what their part in this story is. Invincible Iron Man #11 – Brian Michael Bendis (writer) Stefano Caselli, Kate Niemczyk, Taki Soma & Kiichi Mizushima (art) Marte Gracia (colours) VC’s Clayton Cowles (letters). This is a good issue to start with if you want to give this title a try. Mary Jane and Riri reminisce about Tony Stark as we’re reminded that he is in a medically induced coma. Something happens at the end of this issue which kicks off the next storyline, “The Search for Tony Stark”. Marvel will go back to the old numbering so next issue will be #593. I know, I think it’s dumb. Aquaman #28 – Dan Abnett (writer) Stjepan Sejic (art & colours) Steve Wands (letters). I am waiting for when Arthur and Mera are reunited. Stjepan Sejic got me back to reading this title again but Dan has me hooked with this story of an evil king and the guy he dethroned. Totally Awesome Hulk #23 – Greg Pak (writer) Ibraim Roberson (art) Nolan Woodard (colours) VC’s Cory Petit (letters). I love the Jim Steranko tribute cover by Frank Cho. I traced that cover and wrecked my copy of Hulk King-Sized Special #1. Greg finally unleashes the scary Hulk and this guy’s a right wanker. To keep the Earth safe he shoots Amadeus off into space. I am looking forward to this Hulk’s adventures on Planet Hulk which will continue in Incredible Hulk #709. 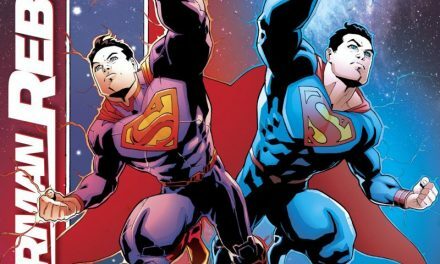 Super Sons #8 – Peter J. Tomasi (writer) Jorge Jimenez (art) Alejandro Sanchez (colours) A Larger World’s Dave (letters). Okay, so the boys find themselves in another dimension and have to fight a living planet named Ygarddis. They get help from a couple of cutie faces but the odds are greatly stacked against the good guys. I like that they have to solve a mystery to get home all while trying to stay alive. Luke Cage #5 – David F. Walker (writer) Nelson Blake II (art) Marcio Menyz (colours) VC’s Joe Sabino (letters). I was not happy with the way this arc ended. The way Luke just let some people walk away without any consequences bugged me. I like the Luke in Jessica Jones and the Defenders but I have yet to find a portrayal of him in a solo book that is as good. Spider-Men II #3 – Brian Michael Bendis (writer) Sara Pichelli (art) Elisabetta D’Amico (inking assistant) Justin Ponsor (colours) VC’s Cory Petit (letters). We are given more information about the bad Miles Morales when we meet his best friend. This guy is even bigger than Ganke. I love how characters are given more oomph by association with others.